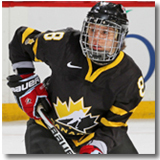 Meghan Agosta joined the Canadian national team in August of 2004, though she would not suit up for the team until the following summer at the 2005 Four Nations Cup. 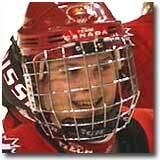 At the 2006 Olympic Winter Games in Turin, Italy, Agosta was the youngest member of Canada's gold medal-winning team and scored a hat trick on her 19th birthday against the Russian team. In 2010, the Olympics were on home soil in Vancouver, British Columbia and Agosta was again Canada's scoring star. She scored nine goals, a tournament record and added six assist en route to helping Canada to the gold medal. For her efforts Agosta was named tournament MVP. At the 2014 Olympic Games held in Sochi, Russia, Agosta would score three goals and add an assist, helping Canada to the gold medal-victory. The win was the fourth consecutive for Canada and the third for Agosta. Gillian Apps was born on November 2, 1983 in Toronto, Ontario. You may recognize her surname as her grandfather Syl Apps was a three-time Stanley Cup champion with the Toronto Maple Leafs in the 1940's. 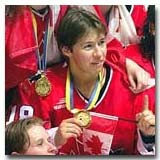 After two seasons with the Beatrice Aeros, Apps competed in her first World Championship with Canada's National Team winning gold in 2004. Adding to her international portfolio, Apps recorded 14 points (7 goals, 7 assists) in the 2006 Winter Olympics en route to a gold medal. A dominating physical force, Apps captured her second World Championship gold in 2007. As part of Canada's gold medal-winning team at the 2010 Olympic Winter Games in Vancouver, British Columbia, Apps scored three goals and added four assists in the five game tournament. In 2014, at the Olympic Winter Games in Sochi, Russia, Apps would add more hardware to her trophy case. For the third time in her career Apps would help Canada to the Olympic championship. 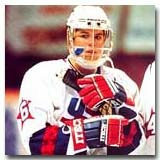 Chris Bailey was a stalwart defenseman for the U.S. National Team. She appeared in five Women's World Championships, winning five silver medals, between the years 1994 and 2001. Other international highlights include a gold medal at the 1998 Winter Olympics and a silver medal at the 2002 Winter Games. Chris started her hockey career in a small town in central New York and continued playing at Providence College where she received a full athletic scholarship. Upon completion of her senior year at Providence she joined the U.S. National Team in Lake Placid, NY. She now does private lessons for kids in Rochester, NY. Jennifer Botterill, was an offensive force for Canada's National Women's Team for over a decade. She has starred at the 1998, 2002 and 2006 Winter Olympics, including a seven-point performance at Torino. Botterill has won gold at five World Championships - 99', 00', 01', 04' and 07', leading the 2001 and 2004 tournaments in scoring and taking home the Top Forward and Most Valuable Player honours both years. An incredibly skilled passer, Jennifer owns the US College record (women's and men's) for scoring points in 80 consecutive games while playing for Harvard University. 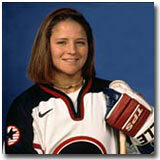 She won the 2000-01 and 2002-03 Patty Kazmaier Award given to the best NCAA female hockey player. On home soil at the 2010 Olympic Winter Games, Botterill was a key player for Canada, earning her third Olympic gold medal. Karyn Bye was long considered the 'guts and glory' of the US Women's National Team. Her inspirational play and offensive skills paced the Americans to six silver World Championship medals and a gold and silver at the Winter Olympics. At the 1998 Nagano games, Bye was the American's leading goal producer with five in six games. She ranks among the all time in World Championship scoring leaders with 51 points in 30 games. Bye was also an accomplished collegiate player, scoring 164 points in 87 games at the University of New Hampshire. After graduating from UNH, she earned her graduate degree while playing two more years at Concordia University in Montreal. Shirley Cameron was the first superstar of women's hockey of the modern era. She was a founding member of the Edmonton Chimos in 1972 and played at the highest level of competition for 20 years, playing in the first IIHF sanctioned Women's World Championships in 1990. With the Chimos, Cameron won 16 national championships and was considered by her peers to be the epitome of women's hockey. One year, she couldn't get time off work to appear in the Nationals, but phoned in sick and played anyway. When her picture appeared in the paper, her boss suspended her. She retired in 1992 to coach. Notably, the winner of the 10-game super series between Alberta's top two teams  the Chimos and the Calgary Oval X-Treme  wins a trophy named after her, the Cameron Cup. As Canada's captain at the 2002 and 2006 Olympic Games, Cassie Campbell demonstrated her renowned confidence and charisma in leading her squad to gold both years. A career that witnessed her evolve from defense to scoring forward to checker, Cassie never wavered from her patented passion for the game. 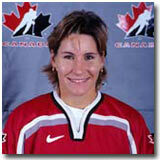 She first participated in the World Championships as part of Canada's 1994 team. Earning gold that year, the team duplicated the feat in 1997, '99, '00, '01 and 04'. Campbell retired from competitive hockey on August 30, 2006 and joined the CBC's Hockey Night in Canada program as a rinkside reporter. Two months after joining the program, Campbell became the first woman to do a colour commentary on a Hockey Night in Canada broadcast. Julie Chu was born on March 13, 1982. The 5'8" native of Fairfield, Connecticut is a three-time Women's World Hockey Championship winner (2005, '08 and '09) and a graduate of prestigious Harvard University. 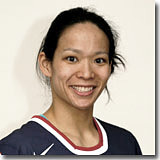 Chu deferred her acceptance to Harvard to participate in the 2002 Olympics where she won silver with the American team. While attending Harvard, Chu was a dominant and influential player who was named team captain and received the Patty Kazmaier Award in 2007, presented to the best female collegiate hockey player. En route to a silver medal at the 2010 Olympics in Vancouver, British Columbia, Chu recorded two goals and four assists in the five game tournament. In 2014, at the Olympic Winter Games in Sochi, Russia, Chu would once again represent the United States. She would capture the third silver medal of her decorated Olympic career. Natalie Darwitz has always been a scoring sensation. That scoring prowess was never more apparent than at the 2002 Olympic Winter Games in Salt Lake City, where she led the tournament with seven goals. Natalie made her national team debut at age 15 and has since won three World Championships ('05, 08 and '09). Her hockey career began at the age of five, and by the time she was in the seventh grade, she was starring for her local high school team. That year, Natalie finished with 85 goals and 48 assists in just 25 games, competing with girls up to five years her senior. In her four years of high school hockey (including the two years while she was in grade seven and eight), Natalie finished with an incredible 312 goals and 175 assists for 487 points in just 102 games. At the 2010 Winter Olympic Games in Vancouver, British Columbia, Darwitz helped the American team to a silver medal, losing 2-0 in the gold medal game to the rival Canadian team. If ever a hockey player possessed the Midas touch, it was Nancy Drolet. Twice she notched the gold-medal winner at the World Championships. In the 1997 final, Nancy scored three goals, including the game winner in overtime to beat the Americans, and again in 2000 Nancy scored the OT winner. In total, she was a member of Canada's championship teams in 1992, '94, '99, '00 and '01. Drolet also played on the Canadian team that won a silver medal behind the United States at the 1998 Olympic Games in Nagano. Her other accomplishments include a softball silver medal at the 1991 Pan-American Games and being named the Sports Federation of Canada's Junior Athlete of the Year in 1992. Recognized as one of the top female ice hockey players of all-time, Lori Dupuis is a pioneer for women's ice hockey in Canada and abroad. She was born and raised just outside of Cornwall, Ontario. After playing minor ice hockey in Cornwall, Lori attended the University of Toronto where she played with the Varsity Blues from 1991 to 1997, and was nominated Female Athlete-of-the-Year in 1996 and 1997. After University, Lori joined the Brampton Thunder of the National Women's Hockey League (NWHL) and was named to the1998-99 NWHL Western Division 2nd All-Star Team. 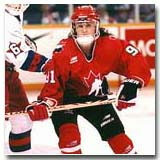 Lori joined Team Canada in the mid 1990s where she won three Women's World Championships (1997, 1999, 2000). 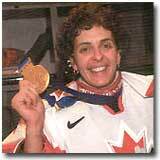 In 1998, she helped her team win the silver medal at the Olympic Winter Games in Nagano. Her career pinnacle was Team Canada's gold medal win at the 2002 Winter Olympics in Salt Lake City. As a freshman at Cornell University, Laura Fortino, led the NCAA in scoring by a defenceman. She made her national team debut at the 2012 IIHF World Women's Championship, helping Canada to the gold medal and duplicated the feat at the 2014 Olympic Games in Sochi, Russia. Fortino was selected first overall by the Brampton Thunder in the 2014 CWHL draft and was named Defenceman of the Year in 2016. Danielle Goyette regularly displayed her offensive dominance at international events. At the 2002 Salt Lake Olympics, she led the tournament with seven assists and finished tied for first in overall scoring with 10 points in Canada's gold medal effort. 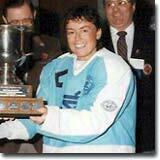 Four years earlier, at Nagano, Danielle led the tournament with eight goals and finished second in points with nine. A great skater with an accurate shot, Goyette topped Canada in scoring with 10 points (three goals and seven assists) at the 1992 World Championships and was an All-Star at the 1994 tournament when she again led Canada with nine goals and 12 points. She proudly carried Canada's flag at the opening ceremony for the 2006 Winter Olympics, a tournament in which she won her second gold medal. 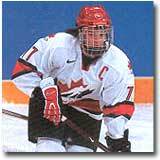 When she retired from pro hockey in January 2008, Goyette ranked first all-time in Canadian scoring at the Worlds with 37 goals and 68 points and second in Olympic scoring with 25 points. In total, Danielle won seven World Championship gold medals. Click Here to view Danielle Goyette's Honoured Member page. Queen's University (Kingston, ON) netminder Elizabeth Graham is credited with being the first goaltender to ever wear a mask for protection. 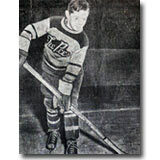 The historic event took place in 1927, three years before NHLer Clint Benedict strapped on his leather mask. As reported in the Montreal Daily Star at the time, Graham "gave the fans a surprise when she stepped into the nets and then donned a fencing mask." Myth has it that Elizabeth's father pressured her into wearing the mask after she underwent extensive dental work. 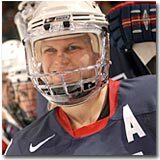 At the time of her retirement Cammi Granato held nearly every individual American record in women's hockey and was the all-time leader in World Championship scoring with an astonishing 44 goals and 34 assists. Under her captaincy and leadership, Team USA won Olympic gold in 1998, silver in 2002, and gold at the 2005 World Championship. The only American player to appear in every official Women's World Championship from 1990 through 2005, Granato did more than any other player to popularize women's hockey in the United States. She was named both the Best Forward and a member of the tournament All-Star Team at the Women's World Championships in 1992 and '97. Cammi is the sister of former NHLer Tony Granato. Cammi was announced in September 2007 as one of the four recipients of the 2007 Lester Patrick Trophy. Less than year later, Granato joined Geraldine Heaney and Angela James as the first women to be inducted into the International Ice Hockey Hall of Fame. In 2010, Granato would again join former rival Angela James when it was announced that the two would be the first female Inductees of the Hockey Hall of Fame. Click Here to view Cammi Granato's Honoured Member page. 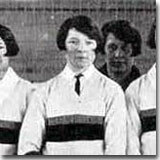 Arguably the best offensive blueliner in Canadian women's hockey history, Geraldine Heaney was a member of seven World Championship-winning squads. 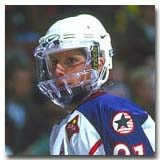 In both 1992 and 1994 she was named the Best Defenseman at the Women's World Championship. Heaney collected six points (two goals and four assists) to rank fourth in scoring for Canada at the 1998 Winter Olympics and was instrumental in Canada's Olympic gold-medal victory in 2002. When she retired later that year, Heaney ranked second behind Cammi Granato in career assists at the Women's Worlds with 28. A fitness fanatic and an all-around athlete, Heaney was considered one of the top female in-line hockey players in the world during her time. She also had a standing invitation to try out for Northern Ireland's national women's soccer team. In 2008 Heaney joined Cammi Granato and Angela James as the first women to be inducted into the International Ice Hockey Hall of Fame. In 2013 Heaney would again join Granato and James when she became the third female inductee of the Hockey Hall of Fame. Click Here to view Geraldine Heaney's Honoured Member page. 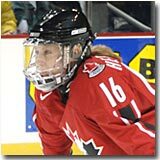 An offensively gifted forward, Jayna Hefford is a seven-time gold medalist at the IIHF World Women's Championship(1997, 1999, 2000, 2001, 2004, 2007 and 2012). A former star for the University of Toronto, Hefford has played in four Olympic Games, capturing silver in Nagano in '98, scoring the gold medal game-winning goal in Salt Lake City in '02, and claiming the gold in Torino in '06 as well as Vancouver in 2010. Jayna ranks among the all-time scoring leaders at both the World Championships and Olympic games. The four- time Olympian was again a key part of the Canadian gold medal-winning team at the 2010 Olympic Winter Games held in Vancouver, British Columbia. In the five game tournament Hefford recorded five goals and added seven assists. In 2014, Hefford would represent Canada in the fifth Olympic Winter Games of her career. She would record three points during tournament play, helping Canada to the country's fourth consecutive gold medal victory. 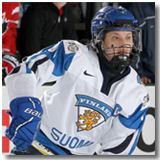 Defender Jenni Hiirikoski has helped Finland to the bronze medal at the IIHF World Women's Championship on six occasions. She also played a key role in bronze medal wins at both the 2010 and 2018 Olympic Games in Vancouver and PyeongChang, earning Best Defenceman honours from the tournament directorate at the latter. When nine-year old Abby Hoffman decided she wanted to play hockey in her hometown, her parents discovered there were no leagues for girls in the Toronto area in the mid-1950s. The enterprising Hoffmans cut their daughter's hair and registered her as 'Ab Hoffman' in the only league available  a boys' league. Ab was selected for the Toronto Hockey League all-star team. But when Ab produced the required birth certificate, league conveners were shocked to discover Ab was really 'Abigail.' She was dismissed from the team and the story made international news. Abby Hoffman later took her competitive spirit to the track, representing Canada at Olympic tournaments in 1964, 1968, 1972 and 1976. Although Abby Hoffman contributed significantly to her hockey team on the ice, it was her contribution to breaking down barriers that added more to the growth of women's hockey in Canada. Abby Hoffman assisted the Canadian Amateur Hockey Association in implementing a national women's championship, and today, representatives from each province vie for the Abby Hoffman Cup.